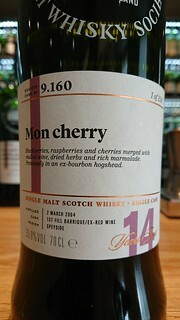 The nose has cherries, raspberries, marmalade and hints of fruits of the forest. The mouthfeel is thin with no cling. The body has cherries, marmalade, mulled wine and blackberries. The finish has cherries and blackberries with a little cinnamon. Water brings out thin, rapidly expanding whorling that doesn’t quite settle before vanishing. The nose gains more cherry, and loses the fruits of the forest. It’s also reminiscent of red wine (Malbec?). The body gains more mulled wine and cherry, and the blackberries are subdued. The finish has more cherry and lose the cinnamon almost completely. A big, rich and fruity dram whose presentation of its flavours can be summarised as “bold”. It occurs to me that the British are famous for their reserve, and “bold” covers a lot of ground. So let’s expand on that by quoting a comedy genius: “It’s all in the best POSSIBLE taste”. That’s this whisky in a nutshell. Outlandish, bold, ridiculous - and definitely great fun.